Zhang Er Photo by Star Black. Zhang Er’s book So Translating Rivers and Cities was published by Zephyr Press in 2007, the original Chinese poems and the English translations en face. We spoke about the book for CCP episode 161 in 2008 (listen there for her reading in Chinese of the poem). Novelist and poet Bill Ransom was one of the co-translators, and he joined us for the drama in studio that day. (Other co-translators who contributed to the book are Bob Holman, Arpine Grenier, Timothy Liu, Susan Schultz, and myself.) The transcription was done by Claire Sammons, now a graduate student at Columbia College in Chicago. 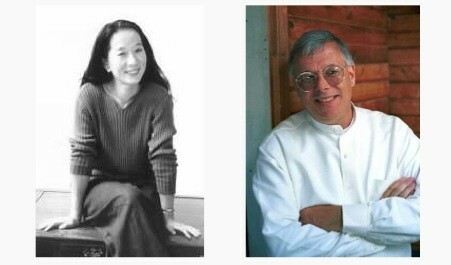 Leonard Schwartz: Today’s guests in studio are Zhang Er and Bill Ransom. Zhang Er has a new book out, entitled So Translating Rivers and Cities. The poems are translated from the Chinese by a number of people, including Bill Ransom, poet, author of six novels and six collections of poet. Both are in studio. Welcome Zhang-Er. Zhang Er: Thank you, Leonard. Schwartz: And welcome, Bill Ransom. Bill Ransom: Yes, thanks Leonard. Schwartz: Great to have you both here and thinking on your feet, literally in the studio. Zhang Er, So Translating Rivers and Cities brings together a number of different periods of your writing, and a number of different books, as I mentioned published by Zephyr Press. I was hoping that you and Bill could read the extended poem, “Mother Event” from the book. Can you say a little about the poem, Zhang Er, and Bill could you say a little about the translation process?